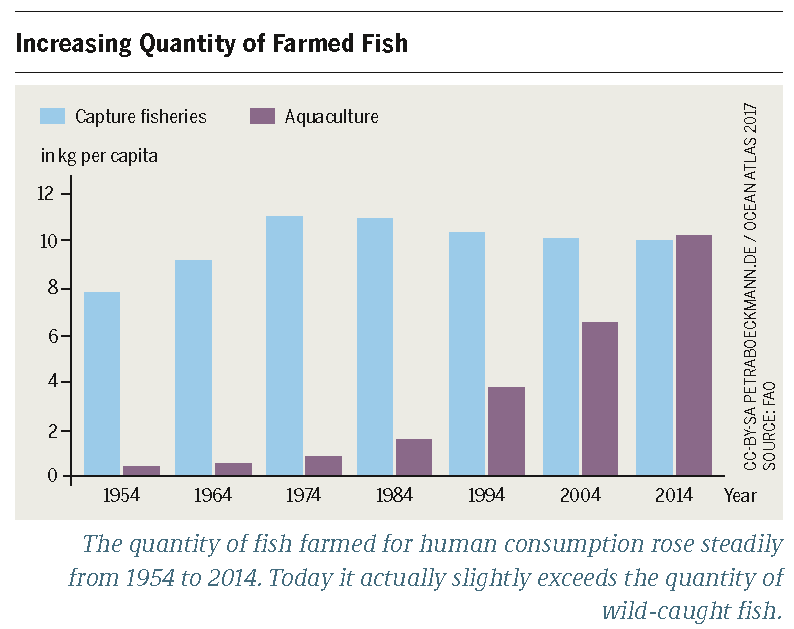 Per-capita fish consumption has doubled over the last 50 years. Demand has risen especially sharply in industrialized and developing countries. Aquaculture has been promoted as a solution since the 1970s and supported with massive state and development fund subsidies. In 1950 aquaculture produced approximately 500,000 metric tons of live weight; in 2014 that figure rose to 73.8 million metric tons, 88 percent of it in Asia. 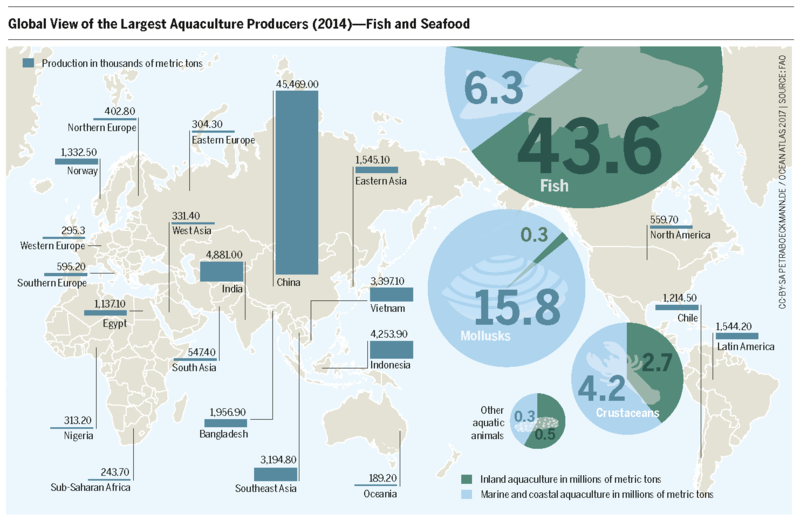 China alone produces 62 percent of the global production and is thus the most important aquaculture country. Aquaculture takes place in ponds, irrigation ditch systems, integrated recycling systems, and large cage systems in the sea. Fish, shrimp, crabs, and mussels are the primary stock. Fish farming on the high seas and on the coasts accounts for 36 percent of total production. The hope is that it will satisfy the continually increasing global demand for fish and seafood as well as provide a solution to overfishing. However, the current industrialized aquaculture is hardly an answer to overfishing and food security needs, as it is often highly questionable – ethically, ecologically, and socially. That’s because the fish and other animals require large quantities of food themselves: producing just one kilogram of shrimp, salmon, or other farmed fish requires 2.5 to 5 kilograms of wild-caught fish. The figure for tuna is closer to 20 kilograms. Raising red tuna in net-cages in Malta thus endangers the local mackerel and sardine populations used to feed the large predatory fish. Therefore, aquaculture does not necessarily help halt overfishing in the world’s oceans. Aquaculture as industrialized underwater factory farming is an ecological disaster. The fish injure themselves, get sick, and fall victim to parasites more quickly. To counter those ill effects, fish farmers rely on antibiotics and chemicals, including pesticides, which pollute the water. The more animals are held in a breeding pool, the more excrement, uneaten food, and cadavers sink into the water below, overfertilizing the water. The nutrient-rich wastewater, replete with traces of chemicals and pharmaceuticals, then flows into the rivers, lakes, and seas, and also soaks into the surrounding soil. Additionally, mangrove forests must often give way to aquaculture. This is especially absurd, given that they actually serve as nurseries for many species of fish. 20 percent of the world’s mangrove forests were destroyed between 1980 and 2005 by human actions, more than half of them (52 percent) due to the introduction of aquaculture. On the Philippines alone, two-thirds of the mangrove forests have been cut down because of shrimp farms. Aquaculture destroys the livelihoods of local populations and leads to local conflicts because it massively reduces the catches of the traditional coastal fisheries. People are driven away or forced into new employment models. Today around 19 million people work in this sector. The working conditions are nevertheless extremely precarious. Contracts are often only verbally agreed upon, worker protection regulations are rare and their enforcement is even rarer. The result: exploitation and forced labor. The International Labour Organization (ILO) estimates that 70–80 percent of aquaculture sites and coastal fisheries are small businesses that rely on the labor of family members. That means that children are subjected to the often physically demanding and dangerous labor conditions of the fisheries. Yet ecologically sound aquaculture is indeed possible, as carp and trout farming show. For many centuries ecological, locally run aquaculture has been a source of livelihood and protein for millions of people, especially in Asia. The example of pangasius farming in Vietnam shows that change is possible. Following the exposure of scandalous farming conditions, the industry is reforming step by step according to new environmental standards, including the ASC Seal (Aquaculture Stewardship Council). That means that no fishmeal from overfished populations is used and that good water quality and low mortality rates must be maintained. Technical solutions to environmentally friendly aquaculture are also being intensively researched – closed recirculation systems significantly reduce the environmental strain, but are expensive and demanding to operate, as well as energy-intensive. 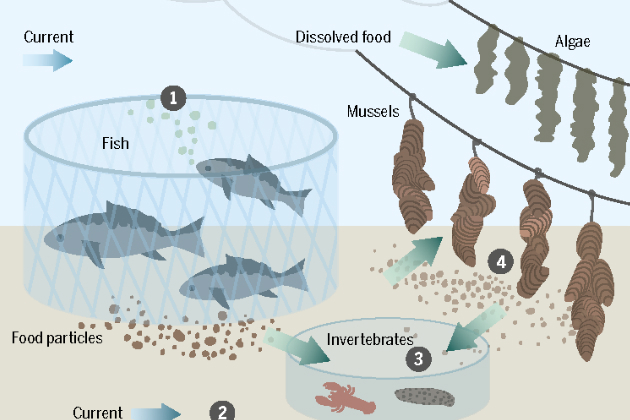 The grave social and ecological consequences of current industrial aquaculture approaches cannot be halted by technical and ecological changes alone. The demand for fish and other sea creatures is the main driver for further developing industrial aquaculture. It serves a profit-driven global market with a great hunger for cheap fish, primarily in the form of mass underwater factory farming. The consumption of fish and sea creatures by the global middle class must be reduced.